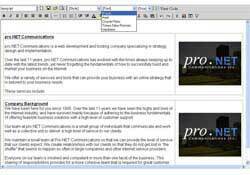 pro.NET's content management tool is an easy way of producing professional looking web content with no knowledge of HTML programming. The tool allows a Word like interface for use when entering text to be displayed on your website. This means that all HTML text formatting tags are entered automatically, so you can concentrate on producing quality content for your site rather than which HTML tag you need to use. The system will also help you to insert headings, lists, images, tables and links to other websites.